Today’s blog is another in the series I have named “Camp Applegate” to provide simple ideas to be intentional and to have fun with the limited time we have with our children. It is Saturday and my wife, Julie and our daughter Summer are at a gymnastics competition in San Antonio. Our oldest, Drew is at a friend’s house all day and I am at home with our middle son Ben, who is feeling a little left out. I have a list of to-do’s calling me to pick up medicine at the pharmacy, installing a fan, vacuuming the pool, and cleaning the terribly dirty windows. What’s more important? The errands will always be there, but missing the opportunity to spend a day with Ben will soon be gone. How do we make this day one we will carve in our memories and communicate to Ben how much I enjoy his company and desire to spend time him? It’s a beautiful cool morning and looks to be a perfect day to be outside. 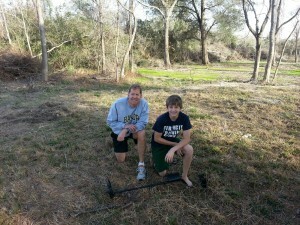 For Christmas, we got Ben a metal detector to look for treasure so off we went to explore some of the many closed in wells that are in the reservoir in west Houston. We live close to the reservoir and have discovered these wells over the years of exploring and spent a couple of hours walking from one to another. Ben would get the signal and I would begin digging until we found the object. 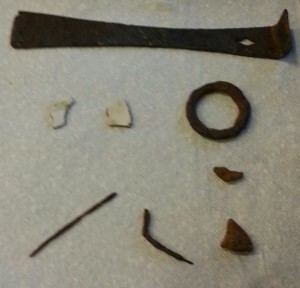 We found nails, wire, a pot handle, pieces of broken painted dish, and a few other chunks of metal and relics we could not identify. We hit Subway for lunch, ran by CVS and came home where I got a couple of hours to vacuum the pool and wash the windows. Then we loaded our bikes and headed off to the Buffalo Bayou where we rode the trails through the woods along the bayou. If not for the number of other bikers on the trail you would never know you were in the middle of the 4th largest city in America. We did not find any gold nuggets, but we did find some time and make memories that we can treasure for a lifetime. My friend Joe White once told me that kids spell love-T I M E. It doesn’t take lots of money or planning, just be purposeful with the time we have and grab those windows of opportunity that we find ourselves in and make the most of them. My hope with “Camp Applegate” is that you will find inspiration and fun ideas to do with your family. As always I would love to hear what you are doing with your family that we can also try. This entry was posted in Camp Applegate, Family Adventures and tagged family activities, Family adventures, family core values, Family leadership, family memories, family mission, family vision, Jeff Applegate. Bookmark the permalink.